Located in the sunny suburb of Sans Souci, an unexciting brick building sits nestled away behind towering Norfolk pines. 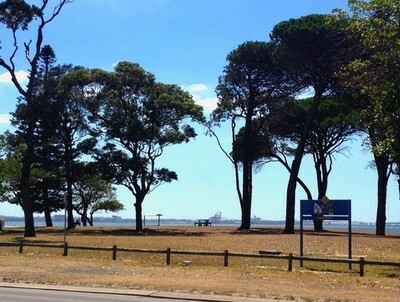 Catching glimpses of tranquil Botany Bay, this unassuming family run café is actually a little French pastry haven. 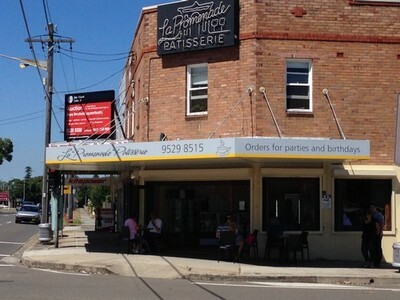 La Promenade Patisserie and café is a favourite among locals. Mothers sit idly gossiping on sun-drenched tables. Cyclists wander in after a morning ride along the glittering bay, and elderly couples enjoy the comfortably quiet atmosphere while reading the paper. The café is light-filled and airy. The décor is clean and inviting, albeit a little dated, and the staff are welcoming and eternally patient; happily allowing you the time to weigh up the pros and cons of each sweet treat, before making your final decision. With so many cakes, pastries and tarts to choose from, selecting just one is nigh-on impossible. Puff pastry, shortcrust pastry, choux pastry and chocolate - what could be better? The four large cabinets overflow with sucrose goodness. 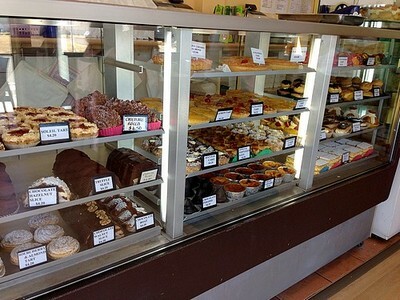 Just make your selection from an array of cakes, pies, tarts, éclairs, slices, pastries, biscuits, and grab a table. While the café is tiny and tables are often scarce; never fear, simply have your treats boxed up and head across the street where you can enjoy the stunning view while savouring your delicacies. The coffee religious - definitely looks like a little snowman. The little boy standing in front of me has been staring confusedly into the large display cabinet, pacing from one end to the other. He finally asks his mother for a chocolate snowman, which elicits quiet laughs from all those within earshot. Admittedly, the little boy cannot be faulted; the chocolate and coffee religious certainly do look like little snowmen. 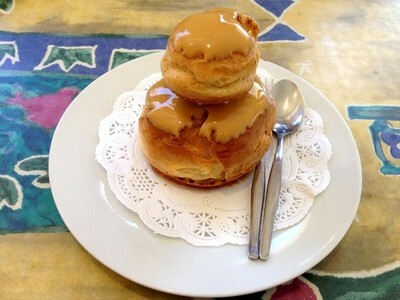 The coffee religious ($4.20), a miniature choux pastry snowman is filled with vanilla crème, and liberally drizzled with a coffee glaze. The choux pastry remains unfathomably crisp. The crème patissiere is silky and decadent, speckled with flecks of black vanilla seed, and the rich coffee glaze injects some much needed sweetness and contrast for the palate. 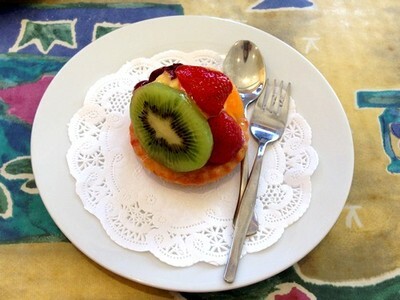 For something lighter, which you can totally justify as healthy - because they have fruit on them, there are an abundant selection of fresh fruit tarts (all $4.20). The sour cherry tart is the perfect balance of sweet and sour, and the strawberry tart is gloriously vibrant in both colour and flavour. In the summer months when beautiful ripe fruits are in season, the mixed fruit tart is hard to beat. Juicy red strawberries, sweet slivers of kiwi, blushing apricots and tangy sour cherries are nestled atop a mountain of vanilla custard, and are sit encased in a crumbly shortcrust pastry. The pastry is biscuit-like and perfectly crumbly. The custard is decadent, yet not cloying, and the fruit is fresh and glossy. The messy, but delectable almond croissant. For something a little more substantial, there is also a selection of savoury and sweet pies, danishes, scones and croissants on offer. 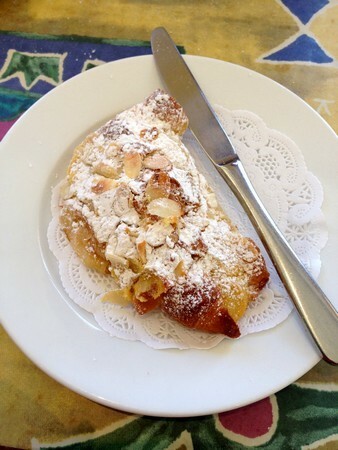 The almond croissant ($3.30), a best seller at La Promenade, is amazing to say the least. A generous dollop of moist almond frangipane filling is ensconced in a buttery, yet light and flaky puff pastry. The whole thing is topped with piles of crisp roasted almonds and finished with a dusting of icing sugar. While eating this almond croissant is rather a messy affair, it is well worth the struggle. Tasty treats and rich, flavourful coffee. 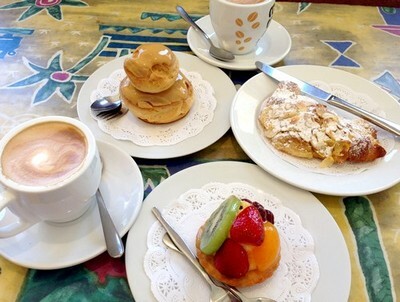 With delicious sweet treats; aromatic full-bodied coffee; unpretentious surroundings and warm, friendly staff; it is easy to see why the family owned and operated La Promenade is so popular with locals. A final word to the wise: if you intend on visiting, come early to avoid disappointment and keep in mind, the café is cash only. Where: 300 The Grand Parade, Sans Souci NSW. 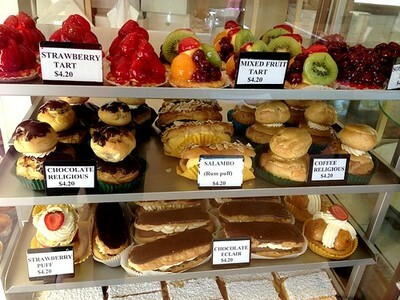 Why: Friendly, attentive staff, and a comfortable atmosphere with delicious cakes and pastries. Cost: Cakes and pastries from $1.70 - $4.50. Coffee and cold drinks from $2.00 - $5. When: 8am - 5.30pm, Wednesday - Saturday and 8am - 4.30pm on Sunday. Closed Monday and Tuesday. Good for kids: Yes, however the café is quite small, and it would be difficult to squeeze a pram between the tables.